This article is about the original 1967–1975 television series. For the remake, see Ironside (2013 TV series). Ironside is an American television crime drama that aired on NBC over 8 seasons from 1967 to 1975. The show starred Raymond Burr as Robert T. Ironside, a consultant for the San Francisco police (usually addressed by the title Chief Ironside), who was paralyzed from the waist down after being shot while on vacation. The character debuted on March 28, 1967, in a TV movie titled Ironside. When the series was broadcast in the United Kingdom, in the 1970s, it was broadcast under the title A Man Called Ironside. The show earned Burr six Emmy and two Golden Globe nominations. Ironside was a production of Burr's Harbour Productions Unlimited in association with Universal Television. The series revolved around former San Francisco Police Department (SFPD) Chief of Detectives Robert T. Ironside (Raymond Burr), a veteran of more than 20 years of police service, forced to retire from the department after a sniper's bullet to the spine paralyzed him from the waist down, resulting in him having to use a wheelchair. In the pilot episode, a TV movie, Ironside shows his strength of character and gets himself appointed a "special department consultant" by his good friend, Police Commissioner Dennis Randall. He does this by calling a press conference and then tricking Commissioner Randall into meeting his terms. In the pilot, Ironside eventually solves the mystery of the ambush. He requests Ed Brown and Eve Whitfield be assigned to him. Ironside uses a fourth-floor room (for living and office space) in the old San Francisco Hall of Justice building, which housed the city's police headquarters. He recruits the angst-filled black ex-con Mark Sanger to be his personal assistant after Sanger is brought in as a suspect who wanted to kill Ironside. Ironside acquires a specially equipped, former fleet-modified 1940 1½-ton Ford police patrol wagon. This is replaced in the episode titled "Poole's Paradise" after the van is destroyed by Sergeant Brown as part of a way to trick a corrupt sheriff. At the end of the episode the patrol wagon is replaced by a one-off fully custom modified 1969 1-ton Ford Econoline Window Van. The show became a success as Ironside depended on brains and initiative in handling cases. Although Ironside was good-hearted and honest, he maintained a gruff persona. Supporting characters on Ironside included Det. Sgt. Edward "Ed" Brown (Don Galloway) and a young socialite-turned-plainclothes officer, Eve Whitfield (Barbara Anderson). In addition there was delinquent-turned assistant Mark Sanger (Don Mitchell), who subsequently attends and graduates from law school (night classes were mentioned from early on), then married late in the run of the series. Commissioner Randall was played by Gene Lyons who died in 1974. After the program's fourth season, Anderson left for personal reasons and her character was then replaced by another young policewoman Fran Belding (Elizabeth Baur), who filled much the same role for four more years. The series enjoyed a seven and a half-season run on NBC, drawing respectable, if not always high, ratings. As the shortened eighth and final season began (only 16 of 19 episodes produced were aired by NBC), Universal released a syndicated rerun package of episodes from earlier seasons under the title The Raymond Burr Show, reflecting the practice of that time to differentiate original network episodes from syndicated reruns whenever possible. 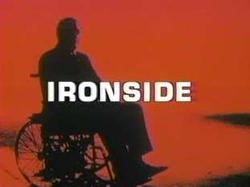 After NBC's mid-season cancellation, however, the syndicated episodes reverted to the Ironside title. The show was filmed in a mixture of locations, sometimes in San Francisco but also with a large number of studio scenes (including scenes with conversations in a moving vehicle, where a traffic backdrop is used). The shows contained stock footage of San Francisco, with pan shots of Coit Tower or clips of traffic scenes. Ironside and his team used a rather large open space on the fourth floor of the Old Hall of Justice in San Francisco at 750 Kearny Street between Washington and Merchant Streets. The Old Hall had already been demolished while Ironside was still in production. It had been abandoned in 1961 and demolished in late 1967. The SFPD had begun using their new home by January 1962. In December 1967 demolition finally began. It took five months with wrecking balls and bulldozers to raze the building. The opening theme music was composed by Quincy Jones and was the first synthesizer-based television theme song, though in 1971, Jones recorded a fuller four-minute band version for the album Smackwater Jack. This recording was then edited and used for the opening credits of the fifth through eighth seasons (1971–75). (The entire album track can be heard in the fifth-season episode "Unreasonable Facsimile" as Ironside and team track a suspect on the streets of San Francisco.) The iconic theme music has since been sampled in numerous recordings and soundtracks to recent television commercials and shows. In addition to the opening theme music, Quincy Jones composed the entire score for the first eight episodes. Oliver Nelson took over those duties up to the end of the winter to spring 1972 episodes. Nelson was then replaced by Marty Paich for all the episodes from the beginning of the fall of that year up until the last episode that was produced in late 1974. The song "Even When You Cry," with music composed by Jones and lyrics written by Alan Bergman and Marilyn Bergman, was performed by James Farentino in the episode "Something for Nothing," while Marcia Strassman had already sung it off-screen in the earlier episode "The Man Who Believed;" both installments were originally transmitted during season 1. Burr and the main cast reunited for a made-for-TV movie in 1993, The Return of Ironside, which aired on May 4, 1993 on NBC, not long before Burr's death. At the time, Burr was starring in a series of telefilms for NBC playing his most famous character, Perry Mason. In the intervening years between the end of Ironside in 1975 and the first Perry Mason movie in 1985, Burr's appearance had undergone some changes. His hair was grayer, he had gained a significant amount of weight, and after years of playing clean shaven characters he grew a beard. Since nearly twenty years had passed since Ironside left the air, and as he had been playing Perry Mason on television for the previous eight years, Burr felt that he was more associated with Perry Mason. He believed that in order to play Ironside properly and not confuse viewers, he would need to undergo a small makeover to distinguish the Ironside character from the more identifiable Perry Mason. Burr thus had his hair colored (which was unnecessary, since Burr was already gray-haired when Ironside originally aired) and cut his beard down to a goatee. One thing Burr did not need to do, however, was pretend to be disabled. At the time the Ironside reunion went into production, Burr had been suffering from kidney cancer that had metastasized to his liver, and the disease robbed him of the ability to stand or walk without assistance. Thus, like Ironside, Burr was forced to use a wheelchair to get around. At the start of its sixth season, Ironside did a two-part crossover episode with The Bold Ones: The New Doctors titled "Five Days in the Death of Sergeant Brown" where Ed is critically injured by a sniper and is treated by Dr. David Craig and his medical staff. Part 1 was broadcast on Ironside and part 2 on The New Doctors. Part 2 is now shown in reruns as an episode of Ironside. E. G. Marshall and David Hartman (stars of The New Doctors) received starring credit in the opening credits of both episodes. Part 2 features a longer edited version of Quincy Jones' Ironside theme as heard on his 1971 album Smackwater Jack. NBC's 1971 fall TV season opened with a two-hour crossover between Ironside and a new series, Sarge starring George Kennedy as a cop-turned-priest. Kennedy's San Diego–based Father Samuel Cavanaugh comes to San Francisco because of the death of a friend and fellow priest and his investigation gets him embroiled with Ironside and his staff. The special consolidated the two shows' consecutive time slots and has been subsequently seen as a TV movie, The Priest Killer. Jessica Walter guest starred in a spin-off episode for the series Amy Prentiss which aired as part of The NBC Mystery Movie during the 1974–1975 season. She played a relatively young investigator who becomes Chief of Detectives for the San Francisco Police Department. Helen Hunt, in an early role, played Prentiss' pre-teen daughter, Jill. Three two-hour episodes were aired. In 2013, a short-lived remake with the same name aired on NBC. Actor Blair Underwood took on the title role (with none of the other characters from the original series being used), while the action was relocated from San Francisco to New York City. This version of the character was more in the tough cop mold, often at odds with his superiors over his unrelenting, even violent approach to police work. The series was lambasted by critics and ignored by viewers, and was canceled and pulled after the airing of just four episodes (out of nine produced). An episode of Get Smart which aired in March, 1969 was titled "Leadside" and featured a wheelchair-using master criminal by that name (and his assistants). Leadside could not walk; however, he was able to run. Another episode, called "Ironhand," had a KAOS operative with a hand encased in metal. The December 1970 issue of Mad magazine included a parody of Ironside titled "Ironride". On The Benny Hill Show, Benny Hill played Ironside in a few sketches, most notably in a sketch called "Murder on the Oregon Express" which parodied several TV detective characters. Impressionist Billy Howard included Ironside as one of the detectives parodied in his novelty hit record "King of the Cops". The 1980 television movie Murder Can Hurt You spoofs numerous TV detectives from the 1970s and '80s and includes Victor Buono playing the wheelchair-bound detective "Ironbottom." American Dad has an episode of "Wheels and Legman" that loosely parodies Ironside in which Roger and Steve have a fictional detective agency. In the "Gone Efficient" Episode of Harvey Birdman, Attorney at Law, a man in a wheelchair is shown pleading a case in front of Judge Mentok (who strongly resembles Raymond Burr) as a nod to both Ironside and Perry Mason. Shout! Factory has released the first four seasons of Ironside on DVD in Region 1. Seasons 3 & 4 were released as Shout Factory Exclusives, available exclusively through Shout! 's online store. On May 9, 2017, Shout! Factory re-released season 3 as a general retail release. Season 4 was re-released on August 22, 2017. In Region 2, Anchor Bay Entertainment released the first season on DVD in the UK on August 25, 2008. In Region 4, Madman Entertainment has released all eight seasons on DVD. The eighth and final season, which included the 1993 TV reunion movie The Return of Ironside, was released on October 19, 2011. Season 5 includes the two-part crossover episode "The Priest Killer", a crossover with the series Sarge. ^ "Awards for Ironside". Internet Movie Database. Retrieved September 8, 2013. ^ "County Jail No. 1 – 1915 to 1961". History of the San Francisco Sheriff's Department. 2015. Retrieved June 7, 2015.